It was daylight. Early morning. There was an explosion.Â I came to andÂ I found myself suspended sideways, onto my right side. I stared at my passenger door tweeter a few feet below me. It seemed really far, then. It’s a really nice brushed aluminum piece surrounding a chrome handle. “Yeah. I’m okay,” I said. I said it in a really sour tone, trying desperately to be appreciative and failing. My right palm and left knuckles were bloody and so was my shirt. My head throbbed. The chemicals from the airbags deploying were … unpleasant. Whatever. After anything big happens to me – yes, even with an explosion – I always think, “Whatever.” Next. There was confirmation thereafterÂ that I could get out – and this came with the realization that I would have to unfasten the device thatÂ had saved me in the first place. I guarantee that before this past weekend, I’ve never had to watch where I might pivot 90 degrees and fall after unbuckling myself from my driver’s seat. Saturday morning, I unclicked my seat beltÂ beforeÂ landing in the space where my passenger window used to be. I could feel the glass bits crunch under the clink of my black motorcycle boots. I could hear them against the ground, against my teeth – I could taste them in my mouth. I stood up and looked around. Put my forearms on my ragtop sill and saw aboutÂ 8Â Midcity West neighborsÂ on the spot – after all,Â I had woken them up. And I had hit one of their parked cars. “Hey, wanna get outta there?” a nice guy asked. Get out of where? Where was I? And this car that … surrounded me? There was no way that this was my car. My car was an electric blue stunner. My car had four wheels on the ground with a wheelbase almost as long and wide as the car itself. My car is four years old and not one scratch on it to be found – not even a bumper kisser. Please let me wake up now. MyÂ palm blood stained the back of the kind stranger’s shirt as he hoisted my 120 unitsÂ out ofÂ her driver window. Chelsea’s driver window. That was my window. My car has a name. Just likeÂ Judy JettasonÂ had a name before her. I have had conversations with Chelsea and greeted her everytime I came back to her. I congratulated her on her “whirr’s” everytime her Supercharger propelled us along fast (no turbo lag). I’d console her that I’d be back soon everytime I left her in the garage or on the street. I said “good night” to her after dusk. When I landed on the glass-covered ground I kept walking to the other side of the intersection. And then I had a fit. “Noo! !” I shouted. “No, no, no, noooo…” as I vented my anger. I slammed my coat on the ground, my scarf. I pounded the ground with my fits, repeating how effing stupid I was. I turned around while still on my knees and looked at Chelsea: “Noo…” and proceeded to bawl on like she was the best friend I could’ve ever had.Â Carving Coldwater Canyon. Birthday party errands and visiting friends in the Hollywood Hills. Stable as a ‘stang even on the 10W towards the beach with the top down and able to pass almost anyone I wanted if in the right gear.Â Dreams of taking her to Mammoth soon for some spring snowboarding – just me, my board, and Chelsea. She had seen and conquered the city; I wanted to show her the mountains. Adrenaline, on. “I guess I should call 911,” I said to the neighbors. I pulled out my cell phone. All 8 of them looked at me and laughed – “Oh, that’s been done awhile ago.” I wondered if there was something I could do. They told me to sit down. What a preposterous idea. I continued to pace. Ambulance. Sirens. Squad cars. A gurney. “Do you wanna go to the hospital?” Ambulance Guy asked. “No,” I said simply and waved them off. They left. A police lady on a power trip who wouldn’t let me get my coat where I had slammed it (yeah – they come in all sexes) – the men waved her off. Crescent Heights makes a turn right there. I wasn’t paying attention. It could have been that I dozed off – but I will tell you that I remember rowing into third gear just as I was crossing the green at 3rd Street just a block earlier. Next I knew was an explosion…that’s it. That’s “what happened.” No one else was hurt, thank goodness. The neighbors confirmed to me that there is an accident in that exact spot once per month. The parked car I hit was on a turn facing the opposite direction and on the other side of the street – which means I overdid the turn because I was turning with it. If I was dozing off andÂ goingÂ straight I would’ve hit a car on the same side of the street. This, the first accident I’ve caused in driving in Los Angeles for 9 years, could have been exponentially worse and I know this. Yes – other people could have been involved and I know this. Yes – I know a car is replaceable and I am not. So thank you for all your insights. I know you say all ofÂ this for yourselves and not just for me so thank your lucky stars and be responsible – everyone – out there. And be fortunate. As they loaded her onto the tow truck, I said over and over again to Chelsea how sorry I was. I chanted it. And finally, I felt it was finally out of my hands when before, I had simply refused to believe it. So, I uploaded the Twitpic and let the live micro-/blogging and documenting of this chapter begin. I feel especially blessed that no new injuries have appeared in the couple days following.Â I cannot believe how unscathed I came out…and neither can anyone else. Nobody.Â That is a testament to the safety of the New Mini Cooper – and most definitely that someone’s watching out for me. Thank you for all your kind words, all your @estarla replies. They mean the world and it was humbling knowing so many Tweeples cared. 🙂 Thank you! Love you. I’ve written this post with tears in my eyes. And so it’s time. I’m on my way to the tow yard for a final good-bye. 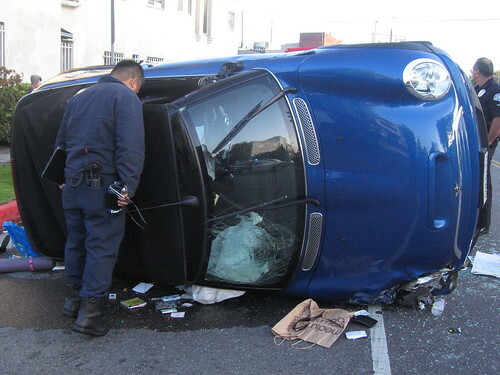 This entry was posted in Mid-City West, Travel and tagged car crash, convertible, crescent heights, los angeles, midcity west, mini cooper S. Bookmark the permalink.